This piece was originally published at The Conversation. 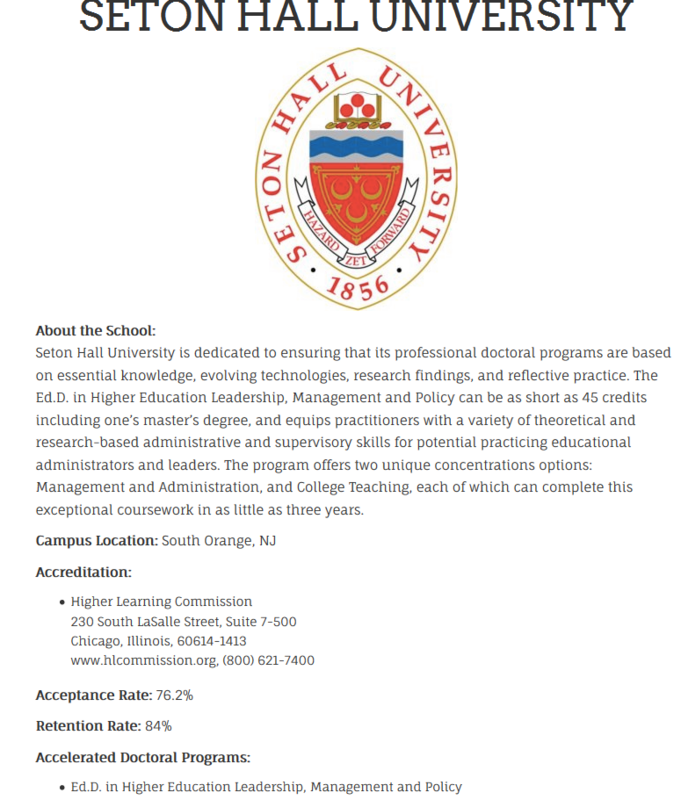 Author RobertPosted on November 8, 2018 Tags debt, student loansLeave a comment on What is Public Service Loan Forgiveness? And How Do I Qualify to Get It? The U.S. Department of Education released updates to its massive College Scorecard dataset earlier this week, including new data on student debt burdens and student loan repayment rates. 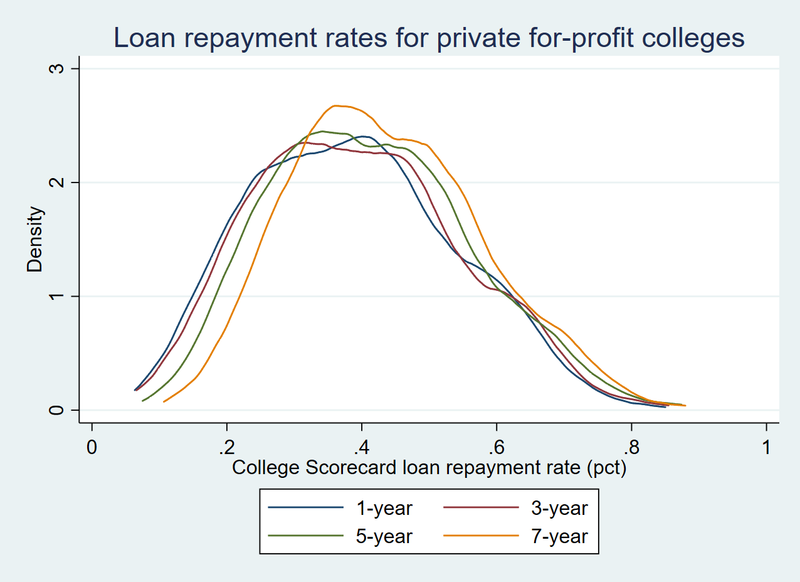 In this blog post, I look at trends in repayment rates (defined as whether a student repaid at least $1 in principal) at one, three, five, and seven years after entering repayment. I present data for colleges with unique six-digit Federal Student Aid OPEID numbers (to eliminate duplicate results), weighting the final estimates to reflect the total number of borrowers entering repayment. The table below shows the trends in the 1-year, 3-year, 5-year, and 7-year repayment rates for each cohort of students with available data. One piece of good news is that 1-year and 3-year repayment rates ticked up slightly for the most recent cohort of students who entered repayment in 2013 or 2014. The 1-year repayment rate of 40.0% is the highest rate since the 2010-11 cohort and the 3-year rate of 46.1% is the highest since the 2009-10 cohort. 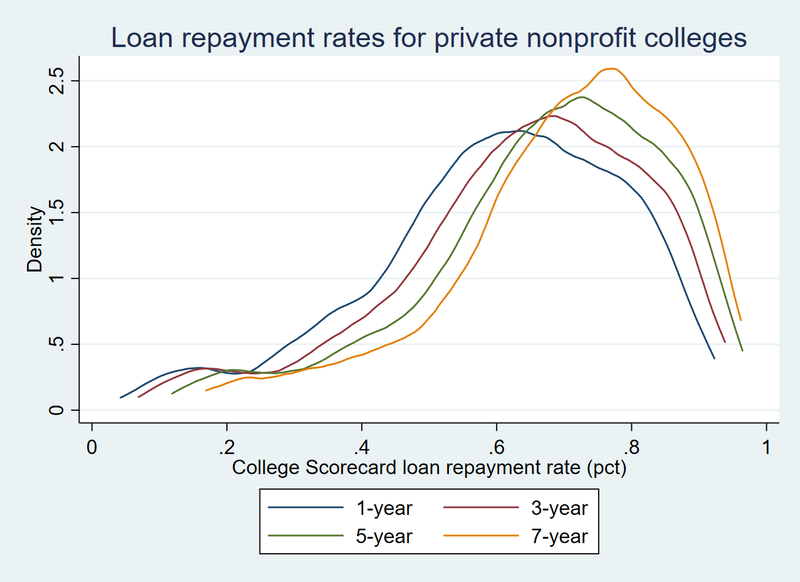 Another piece of good news is that the gain between the 5-year and 7-year repayment rates for the most recent cohort with data (2009-10) is the largest among the four cohorts with data. 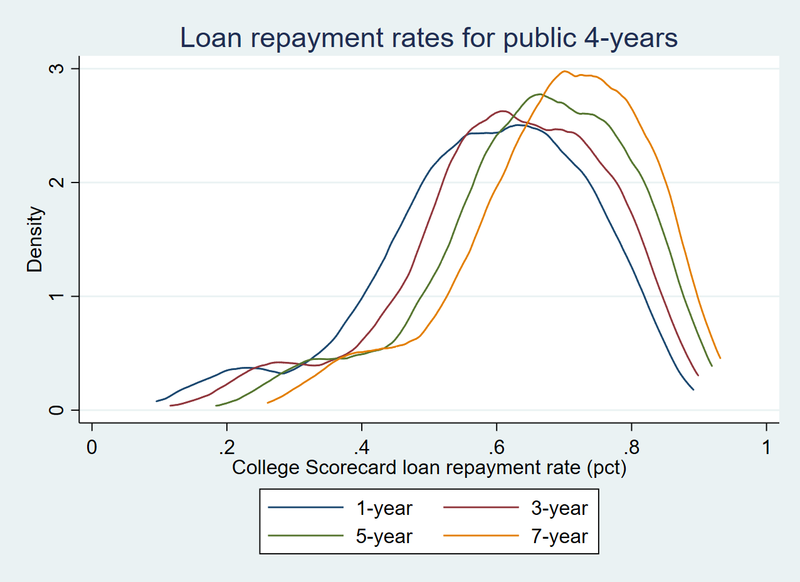 Across all sectors of higher education, repayment rates increased as a student got farther into the repayment period. The charts below show differences by sector for the cohort entering repayment in 2009 or 2010 (the most recent cohort to be tracked over seven years), and it is worth noting that for-profit students see somewhat smaller increases in repayment rates than other sectors. 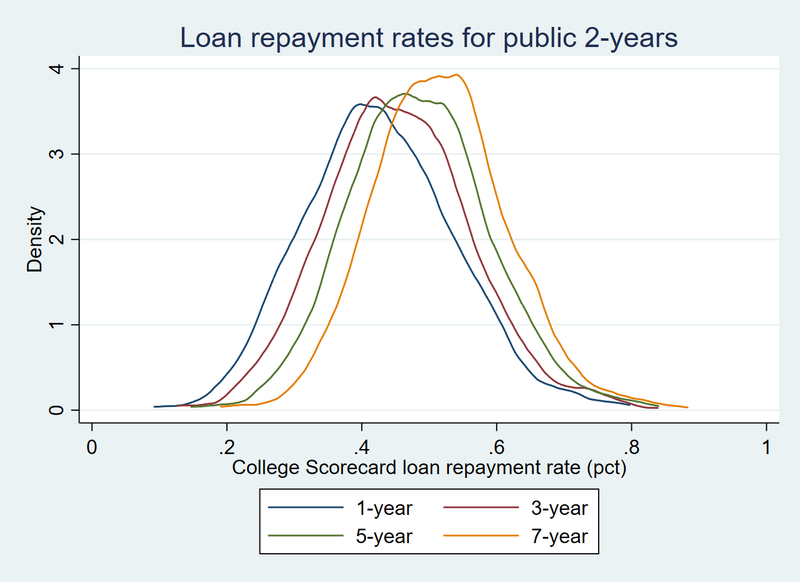 But even somewhat better repayment rates still indicate significant issues with student loan repayment. Only half of borrowers have repaid any principal within five years of entering repayment, which is a concern for students and taxpayers alike. Data from a Freedom of Information Act request by Ben Miller of the Center for American Progress highlight that student loan default rates continue to increase beyond the three-year accountability window currently used by the federal government, and other students are muddling through deferment and forbearance while outstanding debt continues to increase. Other students are relying on income-driven repayment and Public Service Loan Forgiveness to remain current on their payments. This presents a long-term risk to taxpayers as at least a portion of balances will be written off over the next several decades. 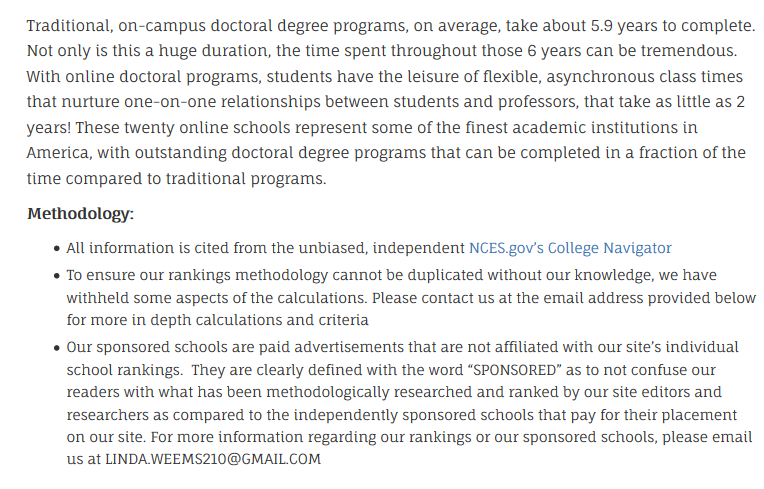 It would be helpful for the Department of Education to add data to the College Scorecard on the percentage of students by college enrolled in income-driven repayment rates so it is possible to separate students who may not be repaying principal due to income-driven plans from those who are placing their credit at risk by falling behind on payments. Some of the numbers for prior cohorts slightly differ from what I presented last year due to a change in how I merged datasets (starting with the most recent year of the Scorecard instead of the oldest year, as the latter method excluded some colleges that merged). However, this did not affect the general trends presented in last year’s post. Thanks to Andrea Fuller at the Wall Street Journal for helping me catch that bug. Author RobertPosted on October 28, 2018 Tags financial aid, free college, politics, states3 Comments on Which Strings Will States Attach to Free College Programs?